Catholic church flower lore, film reviews and more . . . 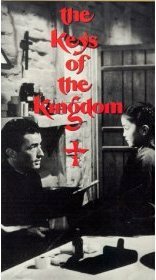 The Keys of the Kingdom is a black-and-white motion picture based on a novel of the same name by A.J. Cronin. It is the story of Fr. Francis Chisholm (Gregory Peck), a Scot who becomes a missionary priest serving in China beginning in the late 1800s. When Francis Chisholm is a young boy, his father is attacked by an anti-Catholic mob. His mother tries to bring her wounded husband home and they both drown while crossing a river in a rainstorm. After his parents' death, Francis Chisholm lives with distant relatives. With no plans of entering a seminary, he attends a Catholic college, Holywell, where he must work harder than most to comprehend and absorb his studies. He annoys his professors by asking questions about the Faith that they perceive as evidence of doubt. The dean of the college, Fr. Hamish MacNabb (Edmund Gwenn), however, understands and supports him. Francis Chisholm has a girlfriend back home who fears he will decide to pursue the priesthood. When he is unable to leave the college for an entire year, she becomes despondent, goes downhill, bears a child out of wedlock, and dies. At this point, encouraged by Fr. MacNabb, Francis Chisholm decides perhaps God is calling him to be a priest. After ordination, Fr. Chisholm fails at his first assignments because of his simplicity, frankness and lack of social skills. Meanwhile, his former dean, Fr. MacNabb, has become his bishop. Bishop McNabb calls Fr. Chisholm in for what the latter expects to be a reprimand. Instead, Bishop MacNabb offers him the challenging assignment of taking over a mission in China. When Fr. Chisholm reaches the Chinese mission, he discovers that the church building has been destroyed and that the Chinese Catholics have all migrated to a Christian village some distance away. The Wangs, an insincere Chinese couple claiming to be Catholic, try to manipulate Fr. Chisholm for financial gain. When he sees through their schemes, they turn on him. He opens a street chapel but is rejected and harassed by the Wangs and other locals. Help comes first through an eager and resourceful young Chinese Catholic, Joseph (Benson Fong), who hears of Fr. Chisholm's arrival, comes in from the Christian village to offer assistance, and becomes a loyal ally. An elderly Chinese woman who knows she will soon die gives Fr. Chisholm and Joseph her tiny granddaughter, Anna, to care for and the three become a community of sorts. Dr. Willie Tulloch (Thomas Mitchell), a hometown friend, sends Fr. Chisholm a case of medical supplies and instructions. Fr. Chisholm then offers free medical care to the townspeople but again he is rejected. When the son of the mandarin, Mr. Chia, is dying of an infection, however, the mandarin calls in Fr. Chisholm as a last resort. Fr. Chisholm successfully treats the infection and the son survives. In gratitude, Mr. Chia gives Fr. Chisholm a large parcel of land where he can construct a new church and school. As the Catholic community is rebuilt, Fr. Chisholm requests that teaching sisters be sent from Europe. When they arrive, the patrician Austrian superior, Mother Maria Veronica (beautifully played by the director's wife, Rose Stradner), is put off by Fr. Chisholm's ways and treats him coldly. During an attack on the town by imperial troops, a heroic act by Fr. Chisholm saves the town but he is left crippled in one leg. Finally, as an elderly man, he is called home to Scotland and given parish assignments where he is again in trouble for his forthrightness. At the conclusion of the film, he is understood by the chancery officials and is a grandfather of sorts to the son of the illegitimate child of his former girlfriend. There is a great deal of humor in the film, especially in the antics of Joseph. The pace moves along nicely. More importantly, the motion picture presents the Church and the priesthood in a favorable light. Fr. Chisholm is soft spoken, dignified, dedicated, chaste, and courageous. There is a lovely sequence in Bishop MacNabb's office when Fr. Chisholm kneels to kiss Bishop MacNabb's ring, then the bishop gets out a bottle of Scotch and they have a heart-to-heart talk during which the bishop offers Fr. Chisholm the assignment in China. When Fr. Chisholm accepts, the bishop gives the young Fr. Chisholm a token that symbolizes the bishop's paternal care. The primary theme of the film is the virtue of humility. One of the ways that theme is beautifully developed is in the relationship between Fr. Chisholm and the aristocratic Mother Maria Veronica. During the story, Mother moves away from the pride she recognizes is her fatal flaw. The change in Mother begins when the Wangs steal from one of the sisters. Mother has hired the Wangs despite Fr. Chisholm's warning about them. In a sacrificial act accomplished with a grace worthy of her noble breeding, Mother gives the sister in replacement for what was stolen a valuable crucifix that has been in her family for generations. At the same time, Mother's view of Fr. Chisholm begins to change. By the end of the story, they have come to love and respect one another. No such character development occurs with Fr. Chisholm's hometown friend, Dr. Willie Tulloch. He is the prototype of the "good atheist" who possesses much natural virtue but trusts only in science, not in God. He comes to China to visit Fr. Chisholm and is fatally injured during the attack by the imperialist forces. He persists in his atheism even as he lies dying. His unrepentant death illustrates the limits of the natural virtues, which do not include humility. Fr. Chisholm prays tenderly for Dr. Tulloch, commending him to God's mercy. During the course of the story, Fr. Chisholm's character as such does not change a great deal either. Rather, by the grace of God, he is placed in a setting where his gifts can best be utilized, and the change that takes place is the development to the fullest of those gifts. This film can be viewed and enjoyed by persons of all ages. There is no impurity, vulgarity, or excessive violence. On the other hand, the story is at times slightly Modernist in its outlook. The phrase "keys of the kingdom" seems to refer to the virtues of humility and charity rather than the keys of St. Peter. I give it four and a half roses. 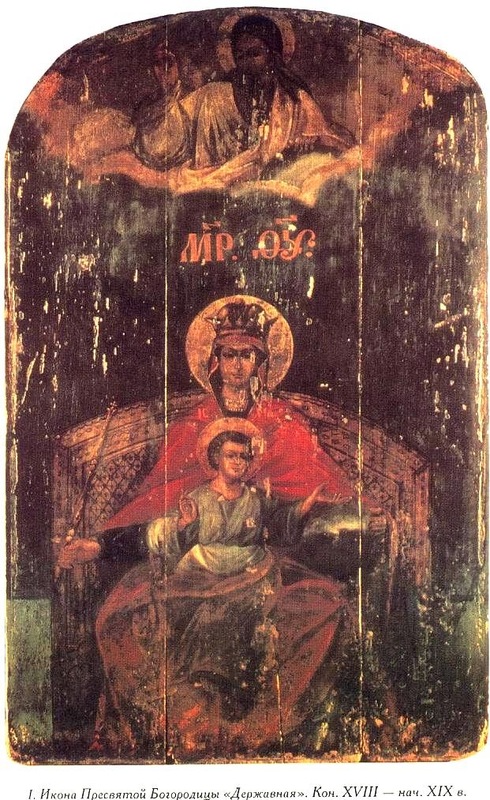 Keys of the Kingdom video cover, from Wikimedia Commons. Copyrighted material. Fair use claimed. This blog is, for the most part, a church flower site directed toward traditional Roman Catholics. It is intended to provide volunteer church flower arrangers with relevant useful information, not to provide photographs of designs that can be copied. 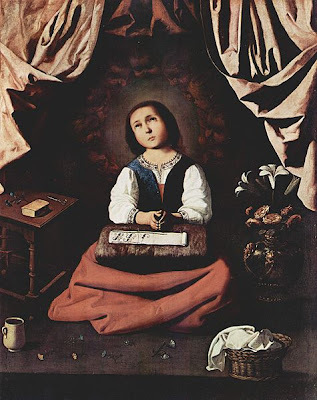 The content should also be helpful to anyone decorating a devotional space in their home, especially if they wish to change the decor in keeping with the liturgical seasons. We live in a time of vulgarity, irreverence -- and worse -- even in high places in church and state. We must not join in this. We need to frequently turn our minds to Our Lord, Our Lady, the angels and saints, and everything we know to be good, beautiful, and true. We need to sanctify our homes in every way possible. We need statues, art, candles, music, books, and flowers that call our minds to higher things and refine us. We need etiquette in our homes as well as in public places. We need to observe the proper order of things. I hope that readers of this site will adapt information found here about church flowers to their "oratories" at home. I hope too that many will honor Our Lady with a Mary garden, whether it be outdoors or on a windowsill or table top. And I hope that our Queen will inspire us to remember that we are only as good as we are in private when we think no one is looking and forget that all of Heaven can see us. 1. When I quote or link content from another site this is not in any way intended as an endorsement of that site, its owners, or even necessarily of the quoted or linked material. 2. Although I attend the traditional Latin Mass and strive to lead an integral Catholic life grounded in tradition, I am not affiliated with any sub-group within (or without) the Church. 3. I am not a catechist or theologian. When I make a statement that has doctrinal or theological content in the course of a movie review or other post, I believe the statement to be correct. But please verify any such statement with a traditional priest or theologian before relying on it. 4. Maria Dolores is a fictional commenter -- a device I use to follow up to posts in a manner I hope is more engaging.